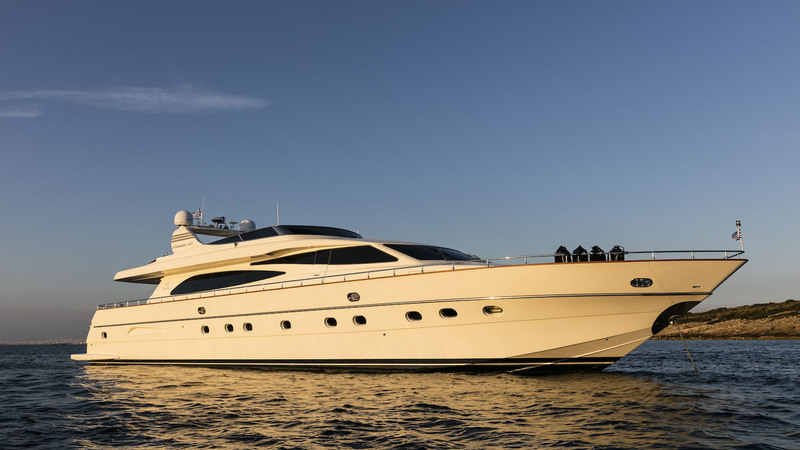 Built in composite by Italian yard Canados in 2003, Blue Bird is able to welcome ten guests in four cabins. Powered by twin Caterpillar 1570HP engines she cruises at 21 knots with a maximum speed of 24 knots. Blue Bird has an impressively sized full beam main salon that features generous lounge seating with an entertainment system, a bar, and a separate dining area. Accommodation includes the full beam master cabin, one double cabin and two twins. Elegantly styled, the interior is rich with beautiful cherry wood and classic furnishings. Outdoor areas are plentiful and the upper deck is a large space that has a dining area, large sun loungers and helm station that enhance the extensive views over the sea. An additional dedicated sun bathing spot is located on the forward deck. The aft deck, which connects directly with the main saloon, hosts an outdoor dining set up plus additional casual seating. Steps lead down to the large transom that serves as a swimming platform and base for launching on to Blue Bird’s extensive collection of water toys and inflatables.